Each week, I’ll go through an exercise from Tracy Fullerton’s Game Design Workshop: A Playcentric Approach to Creating Innovative Games, Third Edition . Fullerton suggests treating the book less like a piece of text and more like a tool to guide you through the game design process, which is why the book is filled with so many exercises. You can see the #GDWW introduction for a list of previous exercises. For this week’s exercise, I’ll name three games I find particularly challenging and describe the reasons why. Last week, I published an exercise comparing and contrasting the conflict in poker and in American football. I touched on conflict as a core component of games. That is, without conflict, you don’t have a game. Game rules and procedures tend to prevent a direct route to the objective of a game. For example, you can’t start playing in World 8-4 in Super Mario Bros. You must go through previous levels, dealing with obstacles and enemies, protecting your limited lives as you do. Challenge is related to conflict. Challenge is one way to engage the player emotionally with the game. If the conflict is too easy to overcome, that is, the challenge is too easy, it can be boring. Think of Tic-Tac-Toe and how young children find it enjoyable to play over and over again, yet grown-ups who know how the game is solved don’t need to play it anymore. Of course, a game which doesn’t adapt the challenge to a player who is learning how to play a game eventually feels similarly solved or mastered. If the conflict generates a challenge that is too difficult, you have another reason why people stop playing a game. It becomes too frustrating to play. A game designer has a tough job balancing the challenge in a game in order to keep players engaged. I love Pac-Man. It’s one of my favorite games, despite growing up with the Atari 2600 version as my first experience with it. When I go to the local bar arcade, I tend to sink quite a few quarters into the Pac-Man upright there. I haven’t memorized any patterns for it, so I play using my knowledge of the ghost AI. I have yet to reach 50,000 points. Each maze is identical, and the objective never changes, but, man, those four ghosts. They have their individual personalities and maneuver the maze the same as always, yet the changing scatter and chase mode switch timings and the way they get just a little bit faster throws me off eventually. They usually get me when I’m being greedy and going for the fruit or trying to eat all four of them when it’s too late. Every so often, I get the urge to play this game. I wrote about my stupid death by a shopkeeper in 2007 and my stupid death by lucky snake bites in 2008. I have never recovered the amulet, and in fact haven’t made it much farther than a few levels down. I’ve been a fairly casual player of it. That said, there is so much to do, and so much I learn each time. One of my favorite sessions involved freeing myself from a bear trap, then picking it up and taking it with me. Then I encountered a small band of gnomes. I was weak, and they were giving chase. 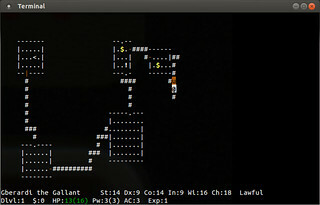 I put down the bear trap, and wouldn’t you know it, NetHack allowed me to set it as a trap. I found out one of the gnomes got caught in it, giving me time to get away as bolts were raining down around me. It was a close one. Between weird interactions like that and random events, each session always has at least one surprise. Usually, though, it’s death. I had a few choices, between the RTS I struggle with or the RPG I never finished or the weird game I can’t wrap my head around. I decided to go with Wizardry 8. I am apparently not very good at RPGs, because it took me a long time to have a total party kill and find that I didn’t get very far in the game. The game is incredibly hard to start with, since your party starts out fairly weak compared to the enemies you encounter. When Jay Barnes did his Wizardry 8 commentary, I was impressed that he made it so quickly through. I had to stop reading it because I still have the delusion that I’ll finish the game myself and didn’t want any spoilers. I did learn that as polished as the game was, the balance wasn’t quite right, so yes, it is very difficult to fight enemies. Besides the combat, there are the freestyle conversations, the lock picking, the magic, the strange mysteries, and more. I remember my last session years ago ending with a bomb blowing up before I could find a way to disarm it. It’s not NetHack, but it was kind of punishing for the casual player. Yet, I will probably install it and give it another go one of these days. Those are just three games that I find challenging, and I’m sure you can think of some more modern ones. As challenging as these games can be, I find that the sense of accomplishment I get is that much more enjoyable. When I passed 40,000 points on Pac-Man or made it one more level down in NetHack, it was progress that I found encouraging and satisfying. If you participated in this exercise on your own, please comment below to let me know, and if you wrote your own blog post or discuss it online, make sure to use the hashtag #GDWW. Next week, I’ll focus on the premise of games.